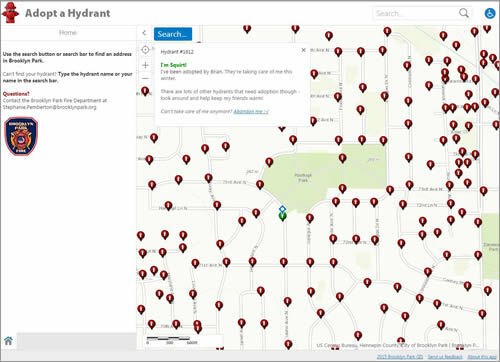 Fire hydrants in Brooklyn Park, Minnesota, are being adopted and given names such as Squirt, Li'l Johnny Pump, and Miss Scarlett, thanks to a new, fun, and inventive Adopt a Hydrant mapping app residents are using. The app was created by the City of Brooklyn Park to encourage people to volunteer to keep hydrants free of snow and ice during the winter months, giving firefighters easy access to water during a fire. Read the article. You can use the Adopt a Hydrant app to zoom in on a Brooklyn Park neighborhood and choose from one of the available hydrants, symbolized by the red icons. 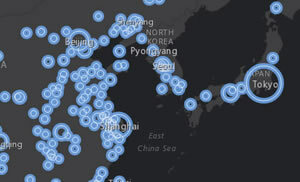 Learn how to make a map with a glowing double ring effect using smart mapping in ArcGIS Online. Esri's Bern Szukalski and Mark Harrower take you through the steps. Read the tip. Esri and the Geneva International Centre for Humanitarian Demining will work together to modernize the software that helps countries plan and manage demining efforts. Read the article. Jared Shoultz of Esri turned to ArcGIS technology to guide his wife, a nurse, home from her job at a hospital after torrential rains brought on by Hurricane Joaquin flooded South Carolina. Read the article. By organizing and analyzing utility information in a GIS, you can turn a heavy load into a lighter one and work smarter. Esri’s Bill Meehan illustrates this using a story about manhole inspections. Read the article. Looking for the latest GIS solutions or want to start developing your own apps? The 2016 Esri Federal GIS Conference and DevSummit DC will be the place to be, February 24–25, 2016. Register today. National Public Radio's The California Report interviews Esri president Jack Dangermond, who explains what digital mapping can do and how the technology makes a positive difference in the world. Listen to the podcast. Gregg Katz from the Shopping Center Group, a real estate services firm, explains why the ArcGIS platform was the best technology choice to help its retail clients better understand a market, trade area, or location. Read the article. Vector basemaps in eight map styles built using a single vector tile service are now available from the Esri Vector Basemaps (Beta) group in ArcGIS Online. Read the blog. Visit the beta group. Sea surface temperature, seafloor salinity, and seafloor bathymetry are just three new oceans-related datasets added to the Living Atlas of the World. Get started using the data. Find out how Esri ArcGIS can simplify managing imagery and remote-sensing data. Read the blog. Read the white paper. Gain a competitive advantage, and advance your career by earning an ArcGIS Desktop Entry certification. Read the blog. Take the exam. Landscape architect and urban planner Arancha Munoz-Criado, a driving force behind implementation of a green infrastructure policy in the Valencia region of Spain, will keynote the Geodesign Summit in January. Read the article. Help identify where new fishways could help Atlantic salmon migrate the Mersey River in Nova Scotia. In this Learn ArcGIS lesson, you will evaluate the dams blocking access to waters. Take the lesson. Global terrain elevation data for use in 3D clients and updated high resolution imagery are just two new updates to Data Appliance for ArcGIS. Order now. Direct Relief used the Survey123 for ArcGIS data collection app on an Android tablet to create on-the-spot medical records for Syrian refugees suffering from skin conditions. The refugees were treated by health care workers at a refugee camp in Jordan. Read the article.